CHRISTINE POULSON » Where do you get your ideas? This can be a difficult question to answer. 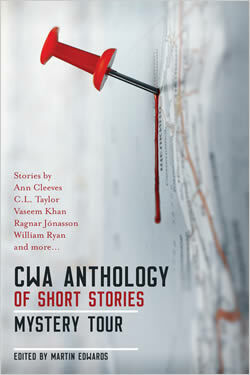 But in the case of my short story, ‘Accounting for Murder,’ which appears in the new CWA anthology, Mystery Tour, edited by Martin Edwards, I know exactly where I got the idea. About eight years my husband and I bought a small, derelict house in Northern France. Restoring it has meant over the years many trips to Monsieur Bricolage, the DIY store. Sorting out some papers a while ago, I found the receipt from one such trip, listing the items that Peter had bought. It occurred to me that it told a little part of the story of the restoration – and right there and then, I had the idea of writing a short story consisting entirely of receipts. And that is more or less what I have done with ‘Accounting for Murder.’ It took me a while to see how I could do it, but once I had, the story almost wrote itself. I was thrilled when it was accepted for the latest CWA anthology, Mystery Tour, which comes out this month, published by Orenda in hardback and paperback with a classy cover. My copies have arrived and I am happily working my way through stories by Ann Cleeves, Kate Ellis, Martin Edwards, Kate Rhodes and many other terrific writers, some of them old friends, others new to me. Might it not be the perfect Christmas present for the crime fiction fans in your life? It might, indeed, Christine! And what a creative way to tell a story, too. I admire your innovation there – very much. Thank you, Margot! It was great fun. I love the idea of a story consisting only of receipts. This book is not available in the US yet but I will keep looking for it. Thank you, Tracy. I wasn’t sure I’d be able to pull it off, but I hope I have. Thank you for letting me know. So pleased!